Rod’s Angry Jerky started a few years ago. The taste of store bought jerky just wasn’t cutting it. So with some encouragement from his family, Rod started experimenting with different flavors and techniques as a hobby. Every batch of hand sliced jerky that Rod made just got him closer and closer to the Angry recipe you taste today. In sharing with friends, family, and colleagues, the overwhelming reviews from all made it an easy decision to share it with the world! 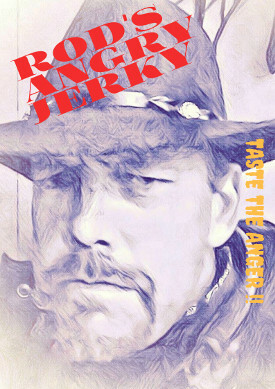 On January 8/2019, the Rod’s Angry Jerky brand was launched. This jerky is distributed under the same name of Rod’s Angry Jerky, and they are based out of Milford, New Jersey. 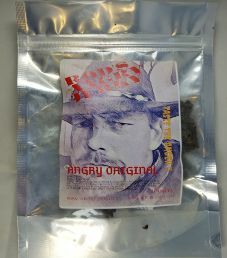 The first review on Rod’s Angry Jerky will focus on a 3 ounce/85 gram bag of their Angry Original beef jerky. 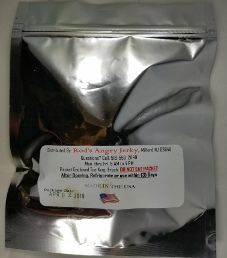 This jerky was kindly submitted for review by the owner, Rodney Shur, The Angry Jerky Guy!! The beef used is guaranteed to have been raised ethically, meaning not administered growth hormones or additional antibiotics. This beef is also guaranteed to have at least partial free range to roam about as nature intended. As a result, the highest ingredient rating possible is Very Good (9/10). The liquid marinade used here is comprised of just super healthy distilled white vinegar and water. 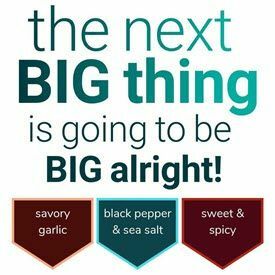 There are some healthy ingredients added such as onion, anchovies, garlic gloves, garlic, chili pepper extract, and spices. There is no nutrition facts table. As a result, the exact sugar and salt levels are unknown. Based on taste alone, the salt level must have exceeded 350mg of salt per 28 grams of jerky to lose a rating. This jerky does qualify to have no sodium nitrite. Instead, salt is the main preservative. To a lesser degree, silicon dioxide and calcium cilicate are also used as preservatives. This jerky does not qualify to have no MSG added, as the flavor enhancer monosodium glutamate is used outright to lose a rating. The highly processed cheap flavor enhancer hydrolyzed soy protein is used to lose another rating. These strips of jerky are medium in size, and sliced borderline thick. The texture is rather dry and chewy, requiring a fair amount of effort to chew. There are some visible signs of fat that add to the natural beef flavor. The aroma is a strong type of soy flavor. The first flavors encountered are moderately strong levels of salt and soy. The trifecta of garlic, onion, and anchovies puts this flavor over the top. While you can never go wrong with the tandem of garlic/onion, it’s the underrated anchovies that does a superb job in elevating this already delicious tasting flavor profile. With only a mild level of sweetness detected, there is a good amount of natural beef flavor present. Each bite finishes off with a light smoked taste in the background that really complements the overall flavor. True about the salt level. One could be forgiven for deducting a taste rating here for the salt. However, this flavor is just too d*mn good tasting to contemplate deducting a taste rating. You get the feeling that a great deal of attention was put into each jerky strip, being deeply and evenly marinated. This bold tasting Angry Original flavor is absolutely brimming with flavor. We highly recommend that you allow yourself the treat of experiencing this Angry Original flavor, you will not be disappointed. 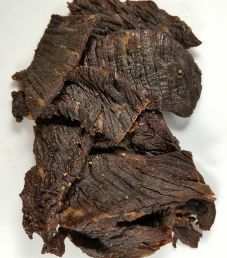 This 3 ounce/85 gram bag of jerky sells online for 8.50. That equates to $2.83 an ounce, which rates as an average price. This silver resealable plastic bag has a label affixed, both on the front and back. There is drawing on the front of Angry Rod. A slogan printed on this bag is “Taste The Anger!!”. There are no facts printed on this bag. Some bag categories missing are the jerky weight not stated in grams, a USDA stamp, barcode, allergen alerts, and a nutrition facts table. To the credit of Rod’s Angry Jerky, a phone number is provided for customer inquiries.